Property developer I-Berhad aims to achieve double-digit growth in net profit by year-end, driven by its unique information and communication technology (ICT) infrastructure, said its director, Eu Hong Chew. “These are the kind of services office users are looking for and they are market-driven,” Eu told reporters after the preview of its RM2.0 billion integrated commercial development, i-City, in Shah Alam today. For the financial year ended December 31, 2007, the company recorded a pre-tax profit of RM700,000 on the back of RM1.631 million in revenue. Eu said i-City was designed as a fully-integrated township, comprising a shopping mall, corporate towers and corporate offices, office suites, shop offices, office and retail suites, hotel, apartments, a data centre and an innovation centre. “Concierge services are also provided in i-City, which is equipped with meeting rooms and event halls in order to cater to the needs of tenants. “All meeting rooms and event halls are equipped with wireless broadband connection and state-of-art audio visual facilities,” he said. YNH Property Bhd is delaying the sale of part of a RM2.1 billion tower being designed by Norman Foster as the global credit crisis threatens the Malaysian capital's biggest commercial property transaction. The company may scrap plans to raise as much as RM1.2 billion by selling the second half of the project and is in talks with funds from Singapore, Hong Kong and Japan on a venture to help complete development of the tower, said Daniel Chan, head of corporate services at the Ipoh-based company. "People are more cautious and want lower pricing," Chan said in an interview yesterday. "This global problem will definitely affect Malaysia. It would be foolish to say we will be shielded." YNH stumbled attempting to carry out Kuala Lumpur's biggest commercial real estate deal as the global credit crisis threatened to tip the world into recession. The Malaysian government said on October 20 it expects slower-than-expected growth next year as the US and Chinese economies cool. 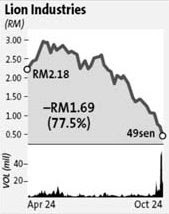 Shares of YNH closed 7 sen lower at RM1.15 yesterday. The decline in the company's shares this year has outpaced the slide in the benchmark Kuala Lumpur Composite Index. The company is delaying completion of the RM920 million sale of the first half of the 45-storey office development to Kuwait Finance House (Malaysia) Bhd, agreed to in January, because of design changes, Chan said. London-based architecture firm Foster & Partners, which designed the Beijing Capital International Airport's newest terminal and "The Gherkin" skyscraper in London, was appointed in March to design the Kuala Lumpur tower. Malaysian real estate prices may stall as the supply of office space will increase from 2010, said Mervin Chow, an analyst at OSK Research Sdn. "A lot of supply will hit the market in Kuala Lumpur, so I'm not too sure whether they can demand a good price by that time," he said. "Supply is going to come in by the end of this year and the momentum is going to peak by 2011. The dynamics of supply and demand by that time is not going to be favourable for developers." There will be an additional 24.8 million square feet of office space after 2010, compared with existing capacity of 56.8 million square feet, Chow said. Malaysia will cut its 2009 economic-growth forecast on November 4, from the current estimate of 5.4 per cent, Deputy Prime Minister and Finance Minister Datuk Seri Najib Razak said on October 20. The developer is negotiating with funds that may take a 20 per cent stake in a venture to develop the tower. Investing in the venture will allow the funds to receive earnings from rental while they wait for property markets to recover. They may then sell the building to a real estate investment trust, Chan said. They "will have the ability to sell the second block to a REIT, that's what they have proposed to us," he said. "It's still in early stages of discussion." The sale will be completed by year's end, later than planned, so the buyers can "make sure everything is right," Chan said. The Grade A tower in Malaysia will have a retail podium and two office wings with total lettable space of 1.2 million square feet. "We are very cautious, we now like to be more conservative in what we are doing," Chan said. "If we are able to achieve our targets, it will be a bonus for us." 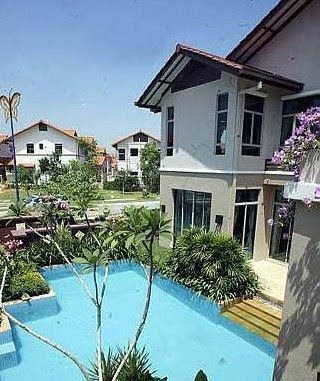 SINGAPORE: The property market in Malaysia will be affected by the US financial crisis but strong liquidity and a firmer ringgit will help to weather the storm, a developer says. Sime Darby Property Bhd managing director Datuk Tunku Putra Badlishah Tunku Annuar said for the country, liquidity would mean further access to mortgages. However, lower interest rates would help to spur interest among consumers to buy house especially on the back of the economic uncertainties, he said. “Malaysia will be one of the markets in the region that will be less affected by the crisis,” he told reporters here ahead of the launch of the rebranded Sime Darby Performance Centre here today. Besides Malaysia, Singapore, which is the second biggest market for the developer, will also offer opportunities despite the current lacklustre property market, Badlishah said. The company has a total landbank of 15,040 hectares in Malaysia, of which more than 75 per cent is for future development. Last year, the Singapore business contributed 15 per cent to the developer’s bottomline while Malaysia’s operations accounted for 80 per cent contribution. 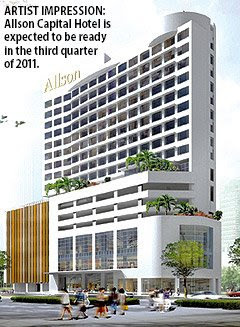 Among its successful projects in Singapore include the Orion, Balmoral Hills and the Sime Darby Enterprise Centre. The company also has presence in Vietnam, China, the United Kingdom, the Philippines, Indonesia and Australia. Badlishah said with the pressure of escalating material costs, the company planned to increase efficiency and procure centrally to help contain the external price pressures. 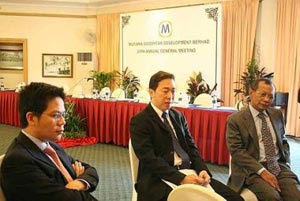 He said the company would also take a cautious stance on new property launches due to the slower demand. Infrastructure and property group UEM Group Bhd expects slower growth in the months ahead because of the global economic slowdown. 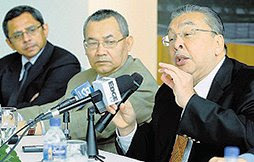 Managing director and chief executive officer Datuk Ahmad Pardas Senin said, however, that UEM Group, which has up to RM5 billion worth of projects in the country and overseas, will not be severely affected by the crisis although slower growth is expected. "We don't feel the impact just yet, but there will definitely be slower growth. "But our projects in Iskandar Malaysia and India are proceeding as planned," Ahmad Pardas told Business Times at the group's Hari Raya gathering in Kuala Lumpur yesterday. The diverse group, which has interests in construction, property and highways, among other sectors, controls UEM Builders Bhd, Pharmaniaga Bhd and UEM Land Bhd, which is expected to be listed by month-end. UEM Group in turn is wholly owned by government investment arm Khazanah Nasional Bhd. On the second Penang bridge, Ahmad Pardas said the group was still awaiting word from the government on any new development. The government last month withdrew the second bridge concession awarded to the group. NANNING: Hall 14 of the Nanning International Conference and Exhibition Centre in Nanning, Guangxi, China, was abuzz with visitors drawn to the Malaysian products on display at the 5th China-Asean Expo (Caexpo), which was launched yesterday. In one corner, two Proton cars - a white Saga and a sporty-looking Symphony (Satria Neo) in orange and black stripes - held sway, drawing admiring glances and close scrutiny. Other Malaysian exhibitors were not overlooked either, as visitors made their acquaintance with Made-in-Malaysia products ranging from assorted jam tarts from Sabah and automotive parts, to Ipoh white coffee and high-end stainless steel jewellery. With almost 100 firms and government agencies from Malaysia promoting their products and services in the 2,900 square metres of exhibition space, there was certainly plenty to see, touch and sample. The Malaysian booths in Hall 14 were part of the 3,300 booths from China and the 10 Asean countries participating in the Caexpo until October 25. The event is co-sponsored by the Ministry of Commerce of China and its Asean counterparts as well as the Asean Secretariat, and organised by the government of Guangxi Zhuang Autonomous Region of China. Held annually in Nanning, it is aimed at spurring the setting up of the China-Asean Free Trade Area (Cafta) and serving as a platform for China and Asean to enhance their bilateral economic and trading cooperation. The expo, which is highlighting information and communications technology (ICT) cooperation as its theme this year, is divided into four exhibition pavilions, namely the Pavilion of Cities of Charm, the Pavilion of Investment Cooperation, the Pavilion of Commodity Trade and the Pavilion of Agricultural Applicable Technology. Malaysia External Trade Development Corp trade commissioner Roslina Long said Caexpo is a valuable opportunity for Malaysian firms to showcase their products to China and other Asean countries. Also held concurrently with the Caexpo is the 5th China-Asean Business Summit and other forums and conferences, including the 3rd China-Asean ICT Week.